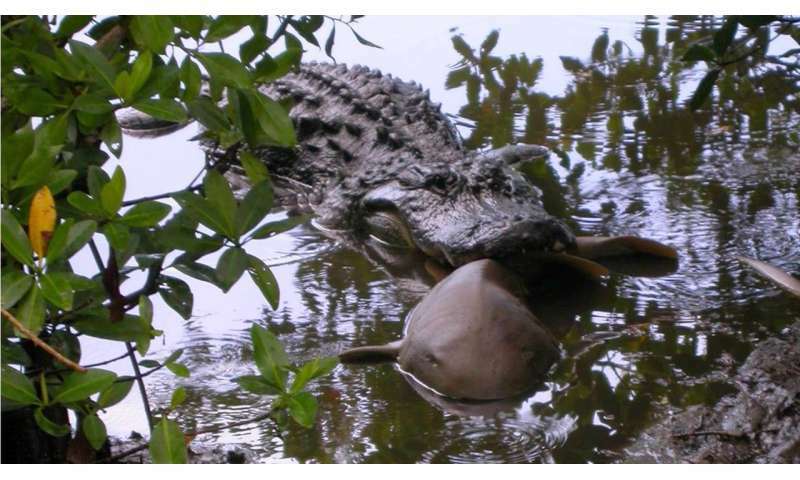 Kansas State University postdoctoral researcher James Nifong documents widespread American alligators' predation of four species of shark like this nurse shark. Credit: U.S. Fish and Wildlife Service J.N. Jaws, beware! Alligators may be coming for you, according to a Kansas State University researcher. "In the article, we documented alligators consuming four new species of sharks and one species of stingray," Nifong said. "Before this, there have only been a few observations from an island off the Georgia coast, but the new findings document the occurrence of these interactions from the Atlantic coast of Georgia around the Florida peninsula to the Gulf Coast and Florida panhandle." "The findings bring into question how important sharks and rays are to the alligator diet as well as the fatality of some the juvenile sharks when we think about population management of endangered species," Nifong said. As part of Nifong's dissertation research, he pumped the stomachs of more than 500 live and alert alligators to learn more about their diet. Researchers also equipped the alligators with GPS transmitters to watch their movements and found that alligators travel between freshwater sources and estuaries, which are a partially enclosed coastal water body where freshwater and salt water mix and house shark nurseries.